Cold out, innit? I'm writing this from the end of The Pier, watching the Thames slowly freeze over under my tiny writing shack. Even wrapped up in hoodie and scarf, I'm shivering. You know what I need? 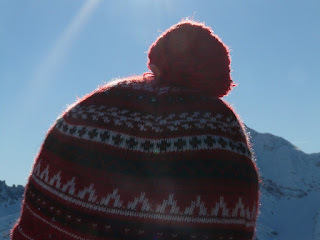 I need a nice warm bobble hat. If you too feel the pull of the bobble, and you're in the North London area tomorrow, then you're luck's in. Our pals at Hubbub are teaming up with TRAID to host a workshop that, at the end of the day, will have you the proud owner of a lovely warm bobble hat that you made yourself! It's all about upcycling, of course. The idea is to bring an unwanted or no longer fit for purpose jumper along to the session at the Lordship Hub Co-Op. It's the ideal opportunity to do something useful with the Xmas pullie you got for last year's Secret Santa. You'll get all the help you need to turn it into fetching new head furniture. A couple of hours and a few steps is all it takes. You'll walk away with the glow of satisfaction that comes from making something yourself. And you'll have warm ears. What more could you ask for? In the frankly unlikely event that you don't have a spare jumper, the guys at TRAID will even sell you one, for a measly suggested donation of £3. Apart from that, it's free to get in, and all materials apart from that all-important jumper are provided. There's even a shwopping event held at the venue beforehand. If you're feeling a bit crafty tomorrow, this is the place to go. FIT are closing the loop on natural dyes!